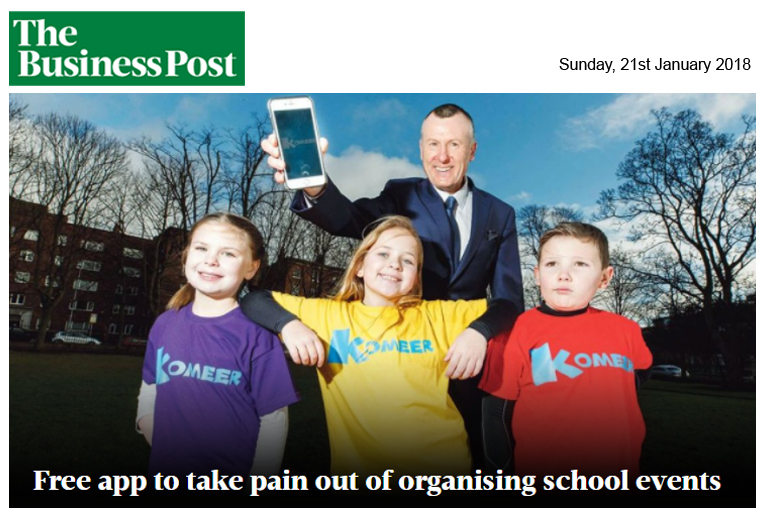 Walsh has invested â‚¬120,000 in Komeer, a mobile two-way messaging service parents can download and use for free on iPhone, Android, Blackberry and Windows mobiles, using their email address to sign up via Facebook or Google. “They can create an unlimited number of groups â€“ one for sports, one for each year, or class, and so on,” said Walsh, who has spent two-and-a-half years developing the app and testing the Beta version with 30 schools before its official release last week. Users reading messages sent from schools via the Komeer app are required to tap their device to confirm receipt. Komeer automatically adds events to parents’ smartphone calendars. Map and location information is another key feature. Responses are summarised for the school on a dashboard, so the principal or administrator can see how many parents have received and responded to their message. “SMS messaging is used by 4,000 schools but its cost is increasing, so currently most schools are paying 5.5 cent per text message or up to â‚¬5,000 a year,” said Walsh. “The app is free for parents and schools and we will introduce some premium services later in the year â€“ for example, Komeer Payments, which will allow schools to collect payments using our app. Walsh is also chief executive of Sky Business Centres, a lead mentor in Clontarf GAA Club, chairman of an Irish NGO, and chairman of Dublin City Enterprise Board Schools Enterprise Awards. “I’m acutely aware of the pain points in organising events and group communications â€“ getting the message out to large groups of people and getting responses back,” he said. “Komeer came about as a better way for communicating rapidly and also encouraging participation and engagement or, in simple terms, getting people turning up at activities, getting more children attending speech and drama and sports activities like football or camogie. Komeer was one of 500 global start-ups accepted on the Facebook FbStart Programme in 2016 and was, last month, announced as one of two winners of the Dublin city Innovation Investment Fund programme.